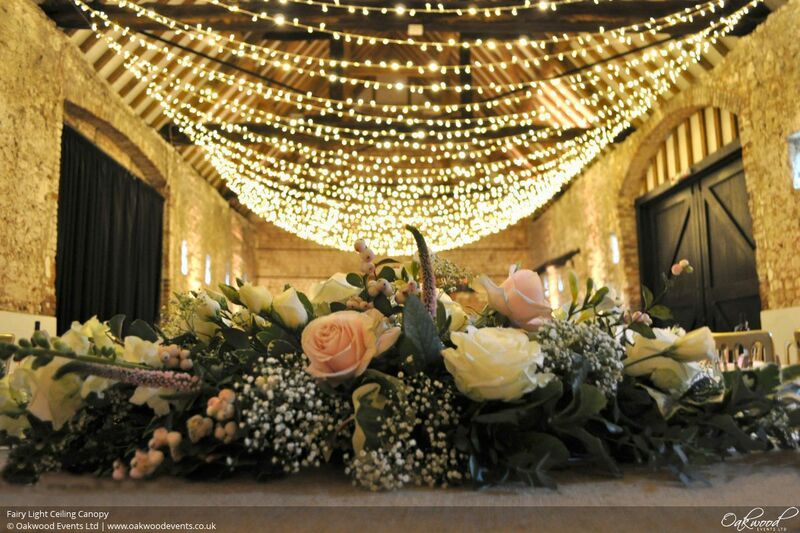 Hire a fairy light canopy to create a warm and sparkling atmosphere at your wedding! 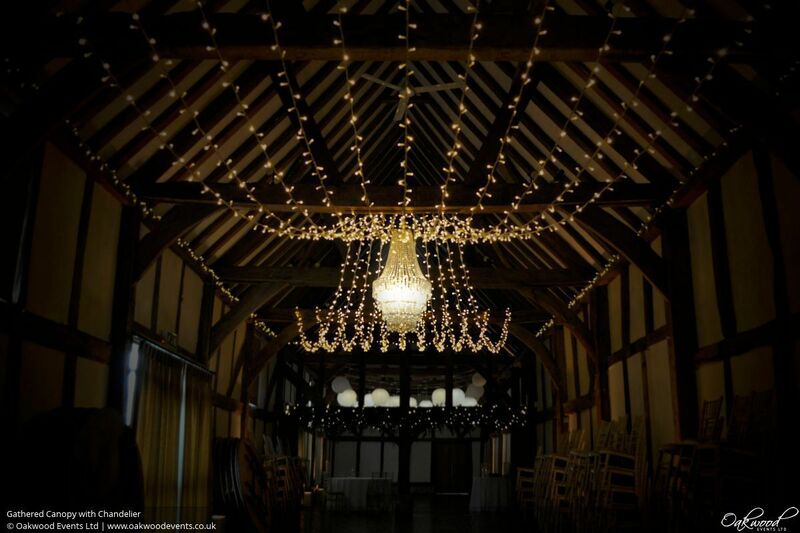 Fairy lights are perfect for wow factor lighting and create an exceptional backdrop for wedding photos, while making the most of venue features like exposed beams and high ceilings. 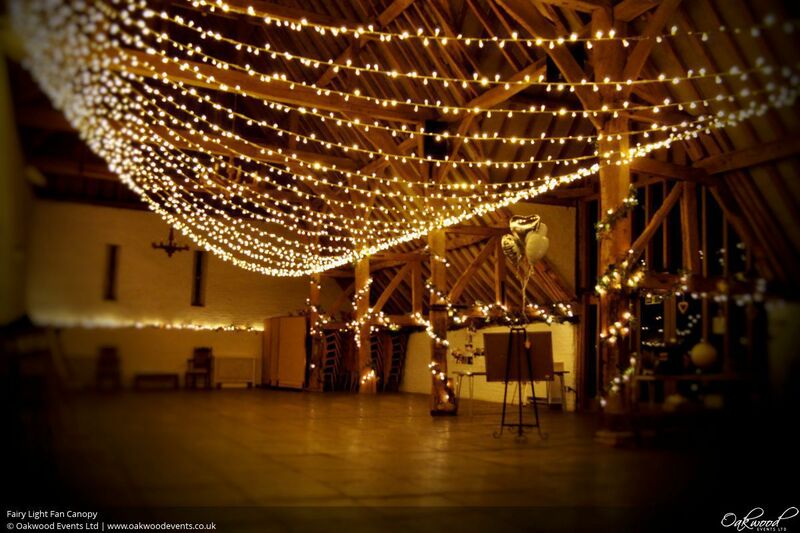 We supply fairy light rental for weddings in Oxon, Berks and Bucks including all equipment hire, installation and removal. 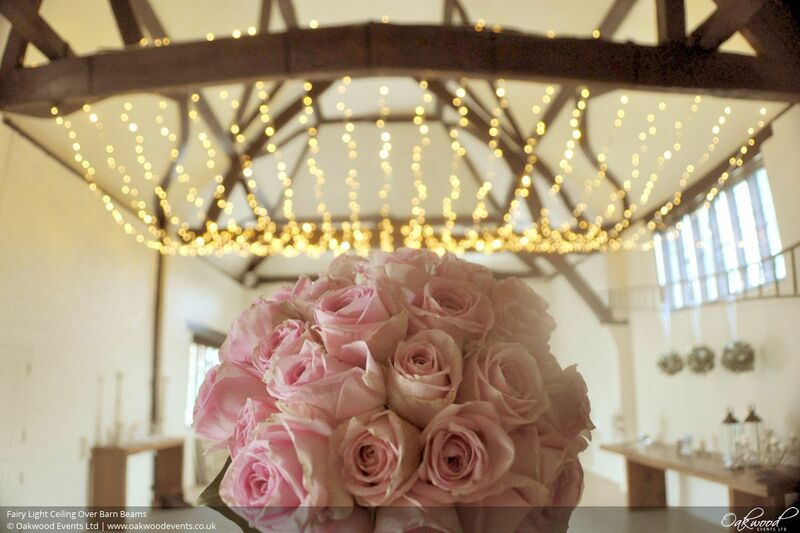 Keep reading for design ideas for using fairy lights to decorate your wedding. 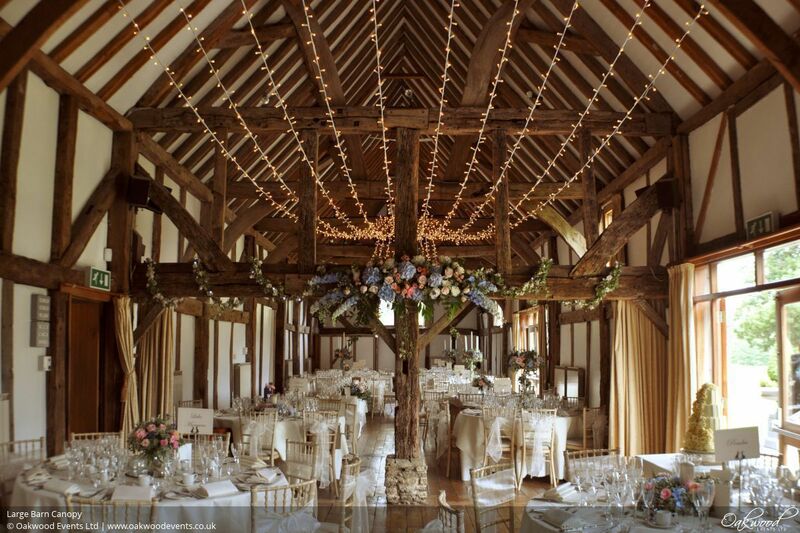 Multi-swag or parallel canopies are one of the most impressive fairy light displays. 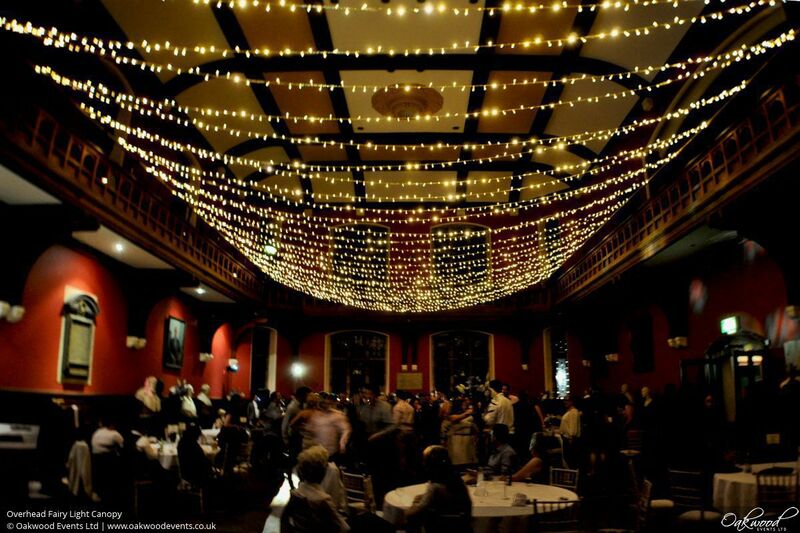 Parallel lines of fairy lights are suspended from the beams, forming several swags of lights along the length of the venue. 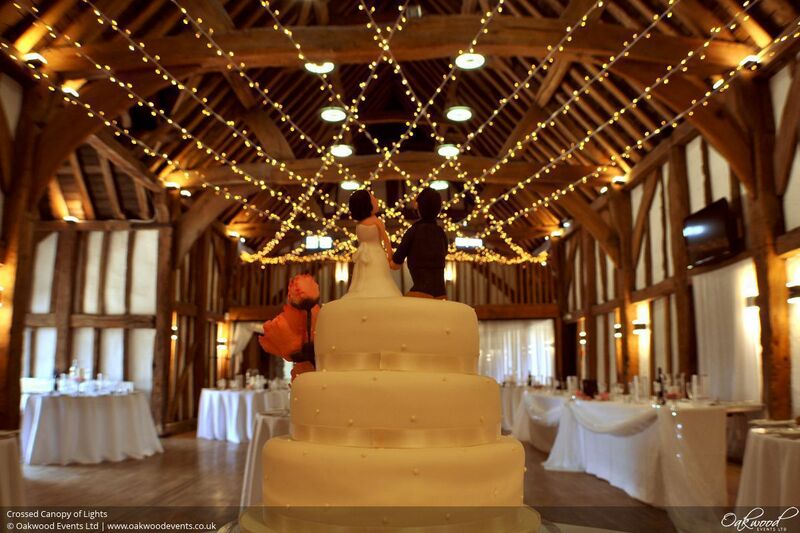 The structured nature of the design combined with the gentle curves of the lights makes for a really beautiful effect. 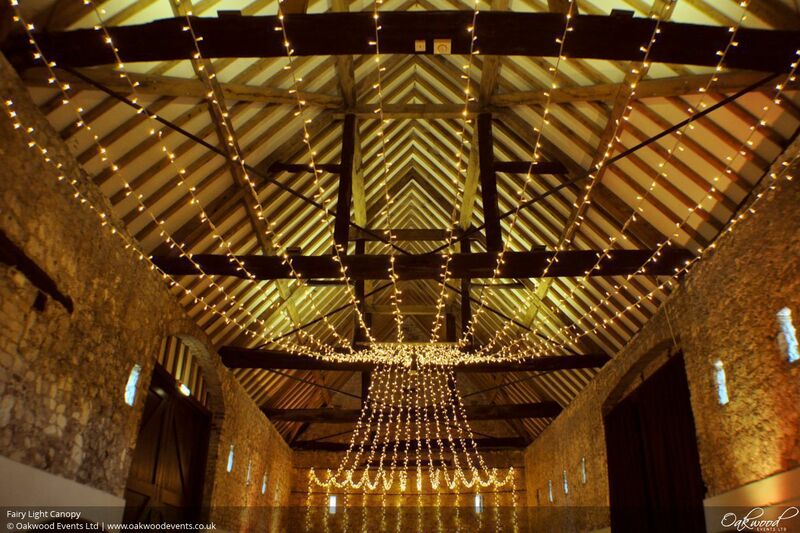 Hung side to side across the width of the barn, widthways canopies create a dense, starry ceiling of lights. 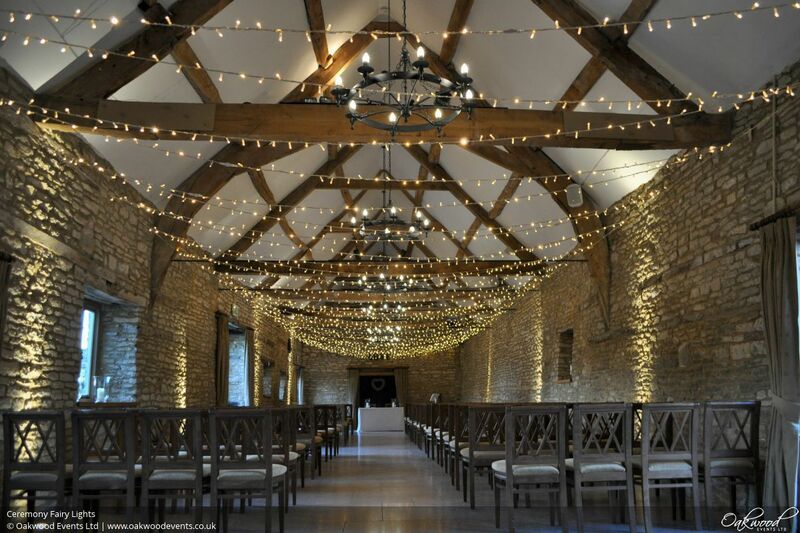 Widthways fairy light canopies are among the most impressive lighting canopies, both in terms of quantity of lights and pure wow factor! As a variation on the multi-swag, gathered canopies offer a fantastic wow factor by pinching the fairy lights closer together in the middle to create a bow shaped canopy. Installed with either a single or double gather depending on the beam layout (single suits an odd number of beams, double is for even), these designs are very popular due to the elegant shape they create. 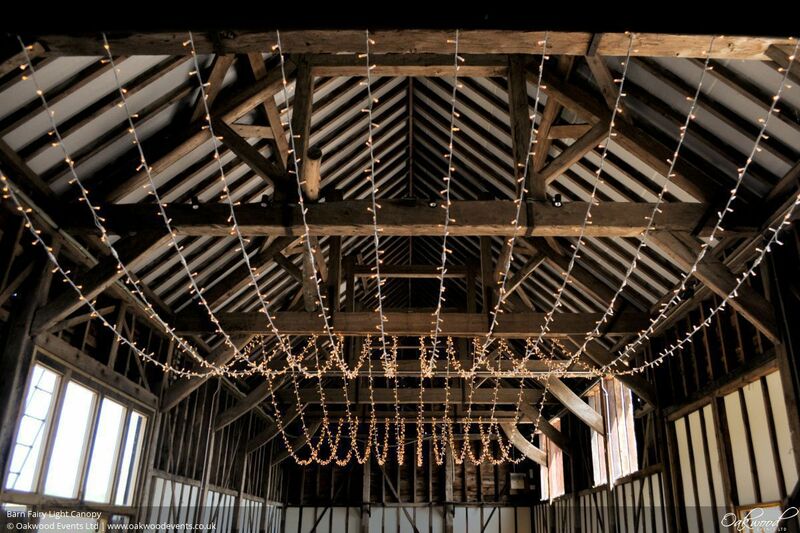 Strands suspended from the beam ends form a series of crosses along the barn. 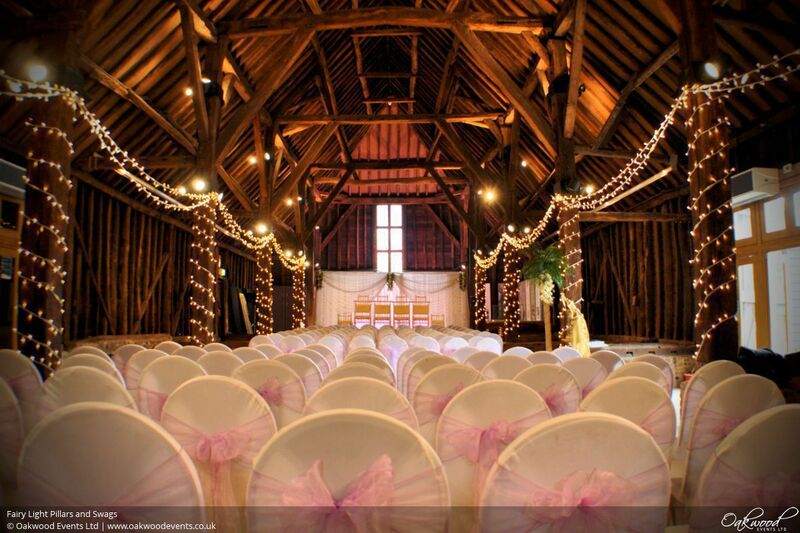 An excellent design for long barns with several beams as the effect looking down the length of the barn is fantastic. Crossed strands works beautifully with fabric drapes, chandeliers or lines of paper lanterns between the crosses for a perfect combination of sparkle and style. 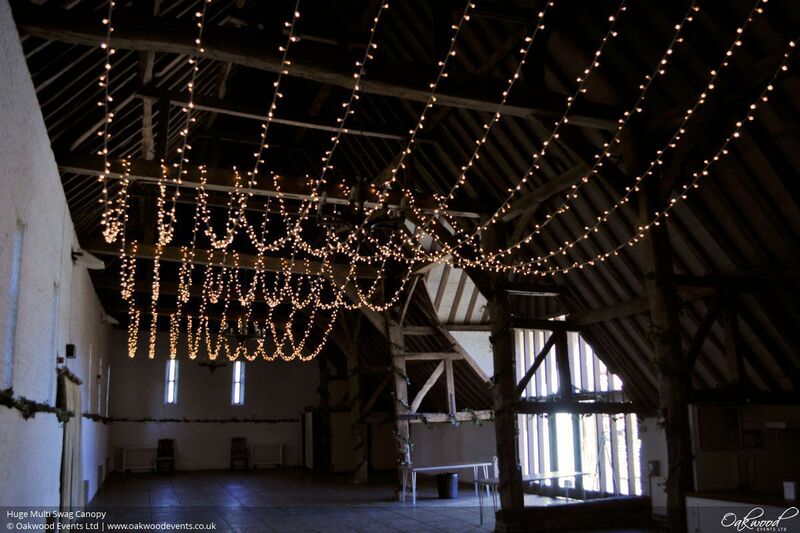 One of our most popular canopy designs is the fairy light star, where strands of lights radiate from a central point to other points around the barn walls. 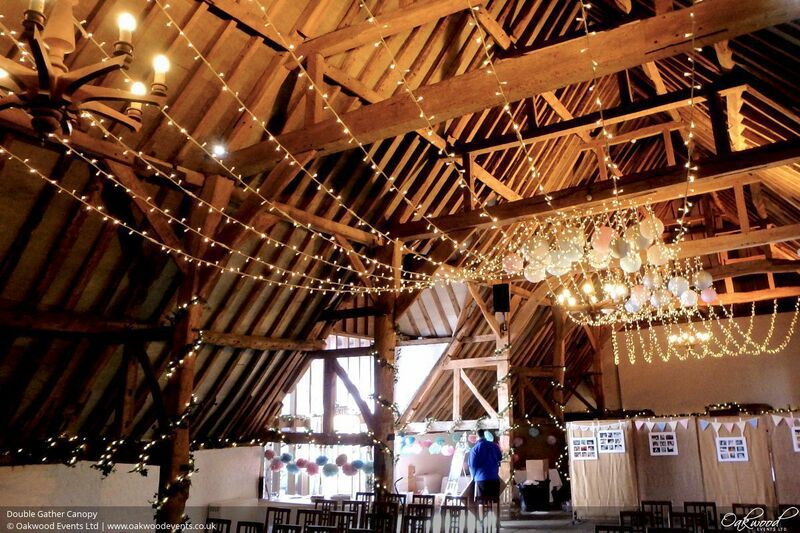 It works well in barns with a high central point (such as a middle beam) but we also design stars with suspended centres for barns with an even number of beams. Stars are popular because they can be combined with other design elements such as a central chandelier or paper lanterns. 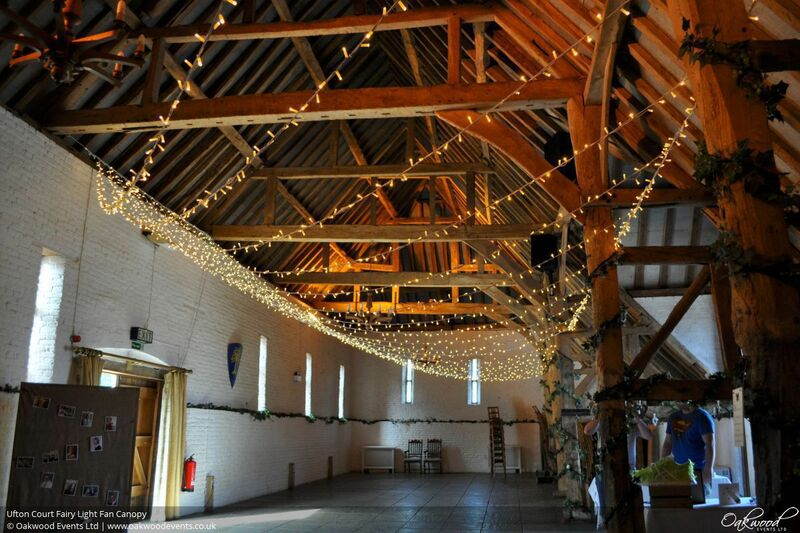 A single swag canopy creates a single, elegant arc of lights between two beams. 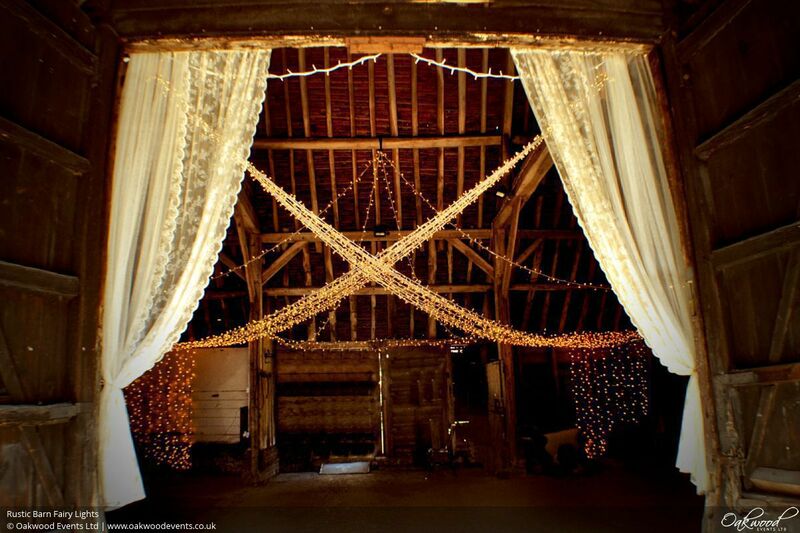 Naturally suited to venues with balconies or for barns with only two beams, this design also works well in larger venues where the generous sweep of the canopy doubles as a sparkly backdrop to photos taken from ground level. Similar in principle to a single swag canopy, but in two halves which cross over to form a criss-cross pattern above the centre of the space. 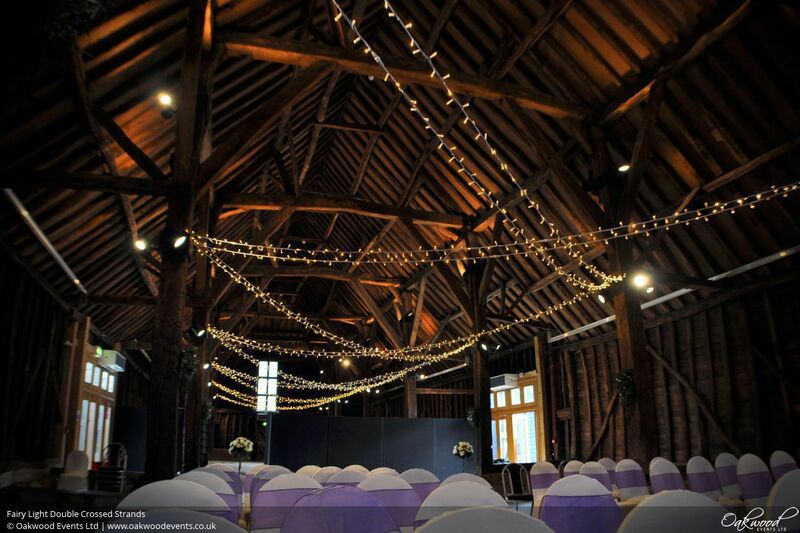 Ideal for venues with two opposing balconies or suspended between a pair of beams. Lights fan out dramatically from a tightly gathered high point at one side to more widely spaced, lower fixings at the other. 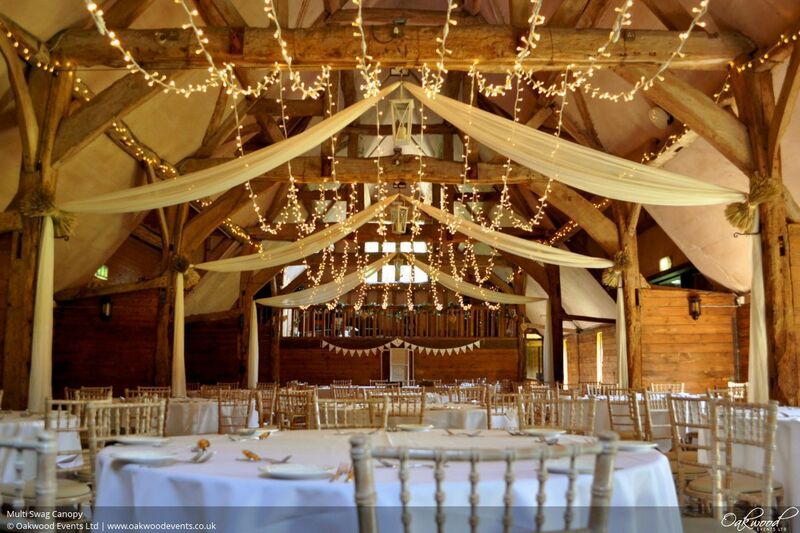 Perfect for tithe barns with a row of pillars along one side, the fan canopy has good coverage and is great for drawing the eye towards a top table positioned under the high side of the canopy. 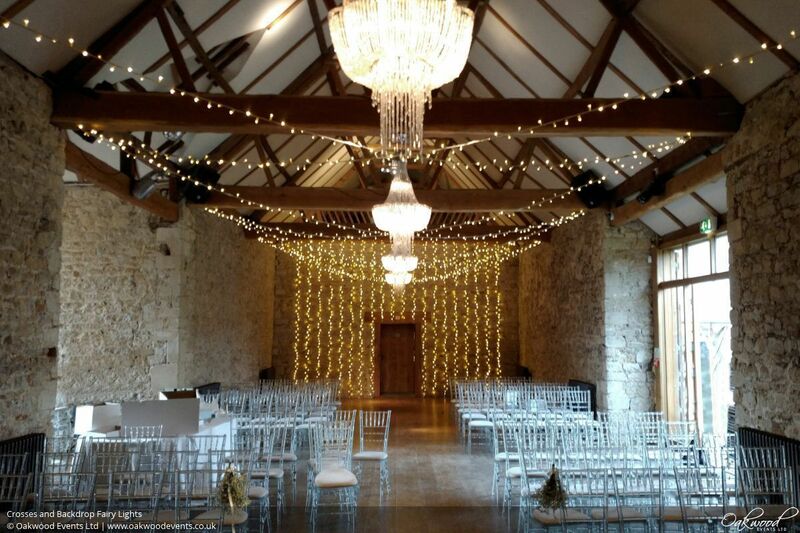 Curtains of fairy lights, wound pillars and swags of lights bring sparkle and style. 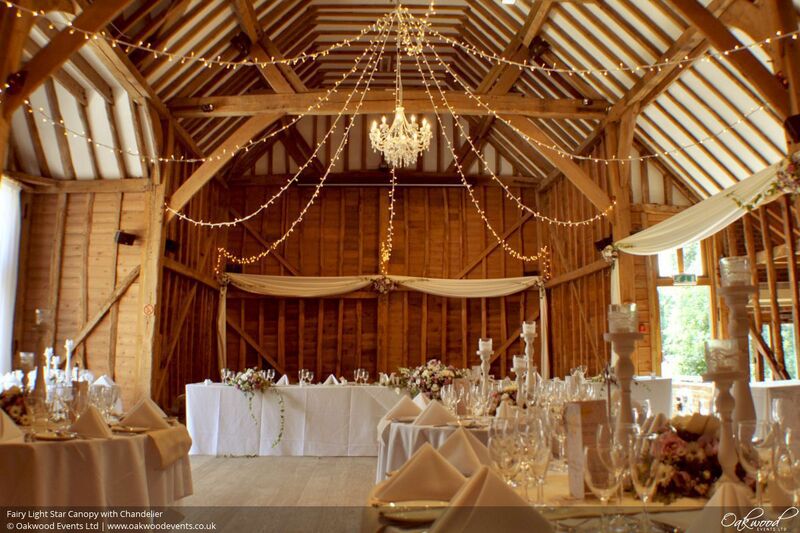 Where a ceiling canopy finishes at a wall or balcony, strands can be dropped down to the floor to create a backdrop. 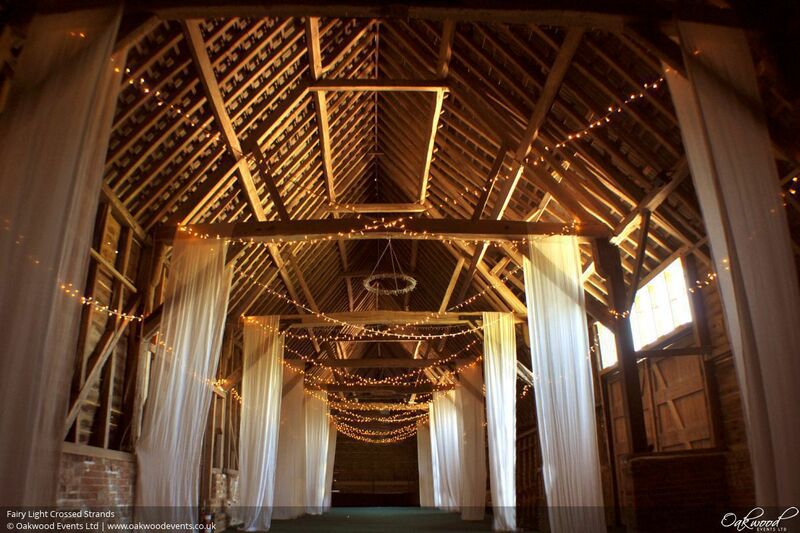 For grain barns with pillars along the sides, lights can be wound around the vertical pillars with hanging lights swagged in between to accentuate the bays and the length of the barn. Winding fairy lights around tree trunks. Adding swags to hedges or fences. 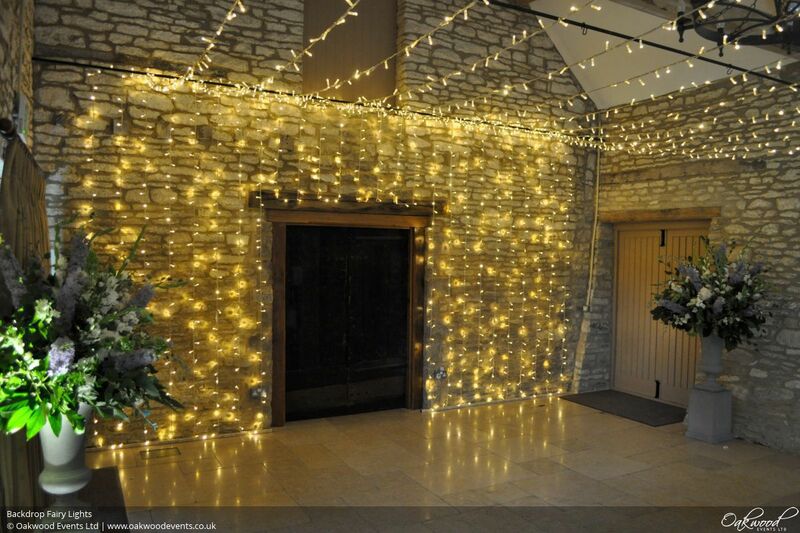 Create a mini fairy light canopy on a pergola or other structure. A high quality installation begins with high quality lights. 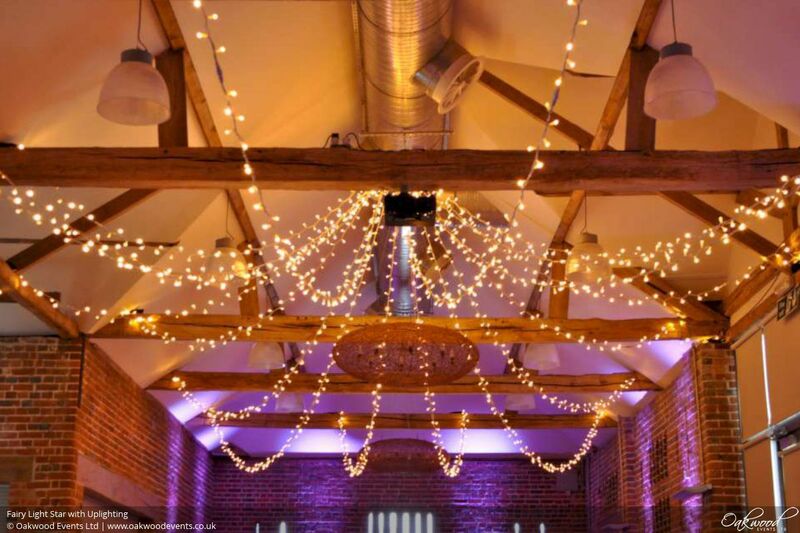 Fairy lights vary in brightness, density, hue, colour consistency and robustness - fairy lights suitable for dramatic ceiling lighting in a large event space like a barn are very different from the lights which would be suitable for a Christmas tree at home. We use exceptional quality connectable lights that are denser and brighter than typical lightweight Christmas lights. 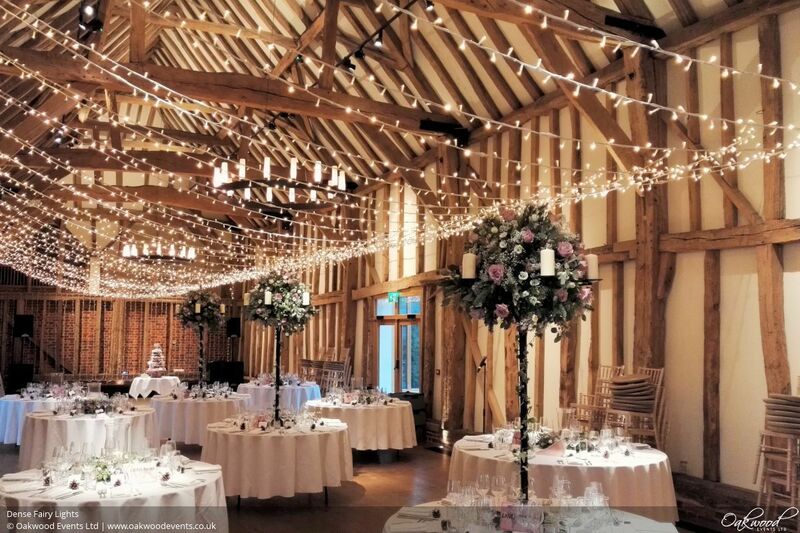 This means they make an impact even in daylight and benefit from being dimmed later in the evening to transform the atmosphere for the evening reception. LED bulbs are reliable and have low power consumption; we favour warm white lights for a golden, candlelit glow which is perfect for a romantic atmosphere and flattering to skin tones. 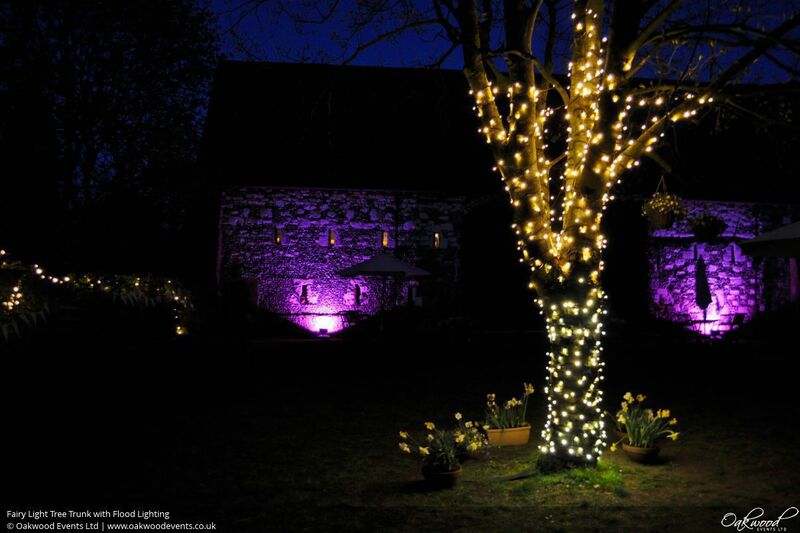 We also have ice white lights which make an occasional appearance for winter wonderland events! 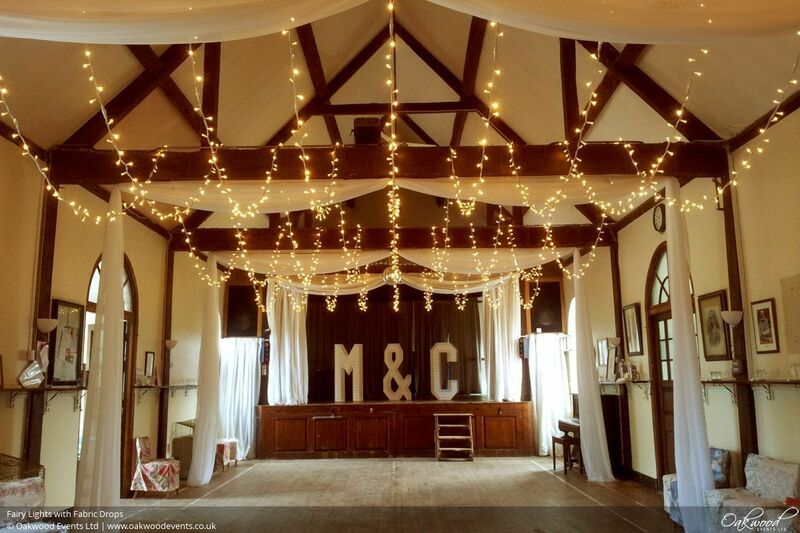 We design fairy light installations to complement the features of each venue, using the latest technology alongside our specialist experience to deliver canopies that are consistently even, level and make the most of the event space. Canopies have to look great from every angle so they look as good in photographs as they do in person. Every canopy is custom designed to the space - the ideal size, drop, spread and layout will be determined by the venue size, beam spacing, number of beams, height, the venue's light fittings and any other permanent features in the space. Combining the wedding style with an appreciation of the venue layout gives the best quality outcome for any ceiling installation. We have specialist equipment to make the most of available fixing points and we pride ourselves on having the utmost respect for the stunning buildings in which we work. 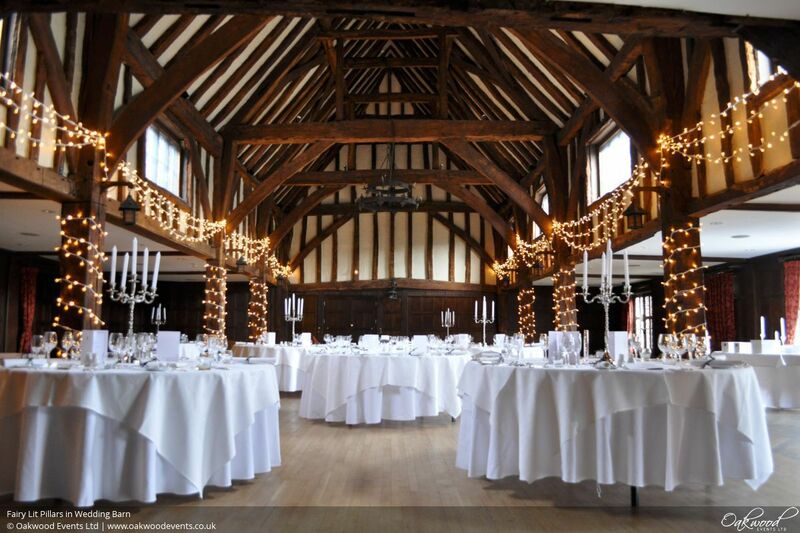 Our fixings are temporary, non-damaging and we're a trusted supplier to venues which are hundreds of years old and have listed status. For lots more images of our work, see our Pinterest boards. 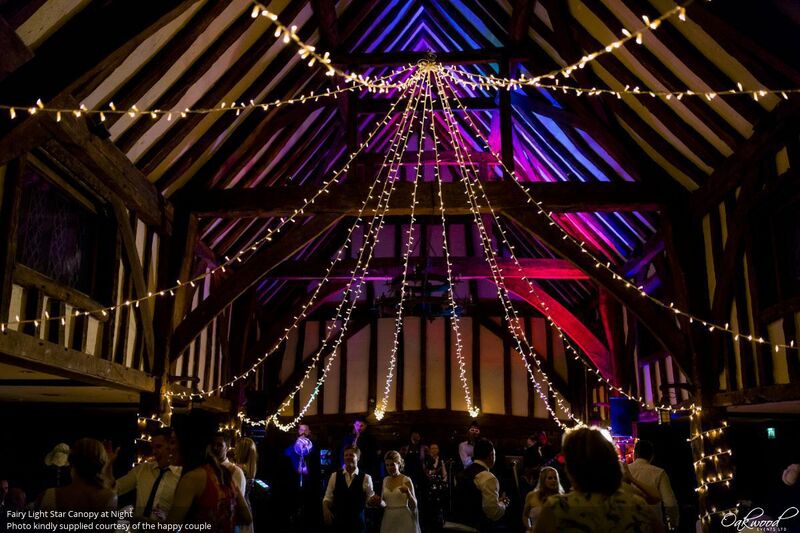 To discuss lighting options for your event or to enquire about hiring a fairy light installation, contact us here.